The largest nearly intact ecosystem in the northern temperate zone of Earth is contained within Yellowstone National Park. Covering portions of three different states in the US, Yellowstone is the nation’s greatest national environmental treasure. 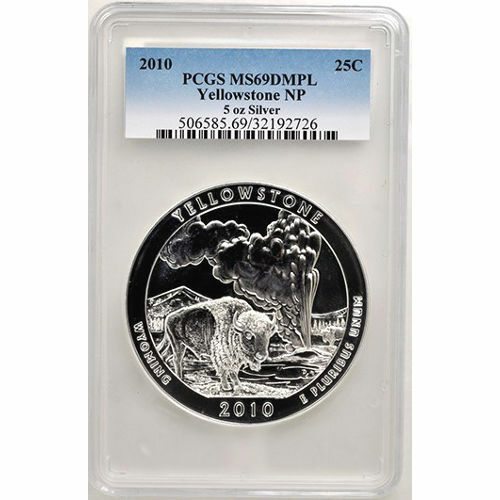 The classic symbols of the park are featured on the 2010 5 oz Yellowstone ATB Silver Coins, available now through Silver.com. 1,743 coins available in this condition out of a mintage of 33,000! Consists of 5 ounces of .999 fine silver. Bears a $.25 (USD) face value from the federal government. Issued a Mint State 69 grade from the Professional Coin Grading Service. Available in a deeply-mirrored, proof-like finish. Yellowstone National Park covers 2.2 million acres in the northwestern United States. The park covers two counties in northwest Wyoming, two counties in southwest Montana, and one county in eastern Idaho. First established in 1872 as the nation’s oldest national park, Yellowstone attracts an estimated 3.394 million visitors annually. The America the Beautiful coin series introduces five new coins each year, honoring various places, moments, and monuments from American history. A total of 56 coins will be introduced during the program, with each of the 50 states represented, as well as the five territories of Puerto Rico, Guam, American Samoa, Northern Mariana Islands, and the U.S. Virgin Islands, and the federal district of Washington D.C.
On the reverse side of the coin is the image of Old Faithful, erupting on its seemingly regulated schedule as a bison stands in the foreground. Engravings read “Wyoming,” “Yellowstone,” and “E Pluribus Unum.” The obverse side of the coin is graced by the left-profile bust of President George Washington commonly found on the standard circulation quarter. Each of the coins in this product listing has a near-perfect grade. This means the coin still has its full, original luster, as well as a maximum of two blemishes. These flaws are not visible, however, within the primary focal are of the coin. 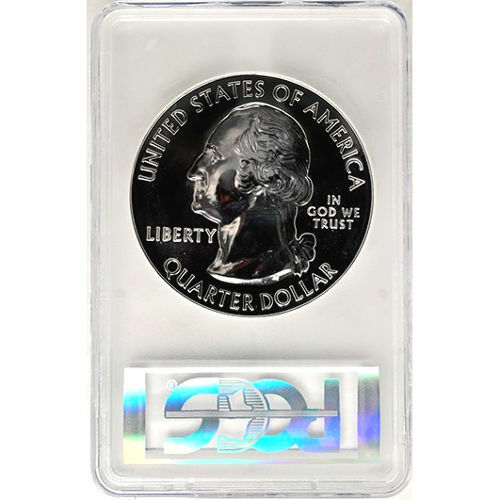 The bullion coins in this listing are available with a deeply-mirrored, proof-like finish. If you have a question about these United States Mint products, don’t hesitate to contact a Silver.com associate. You can contact us at 888-989-7223, online through our live web chat, and via email. 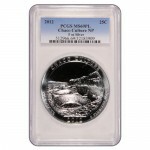 If you are interested in similar products, be sure to check out the America the Beautiful Coins page on Silver.com.